Folder Extensions are custom Data Structures	that also act as Folders. Folder Extensions can be generated with a default set of Create, Edit, Get	andDelete methods,	and can also be configured with custom actions using flows. Create a Folder Extension called Vehicle. Create default page view called Car Details. 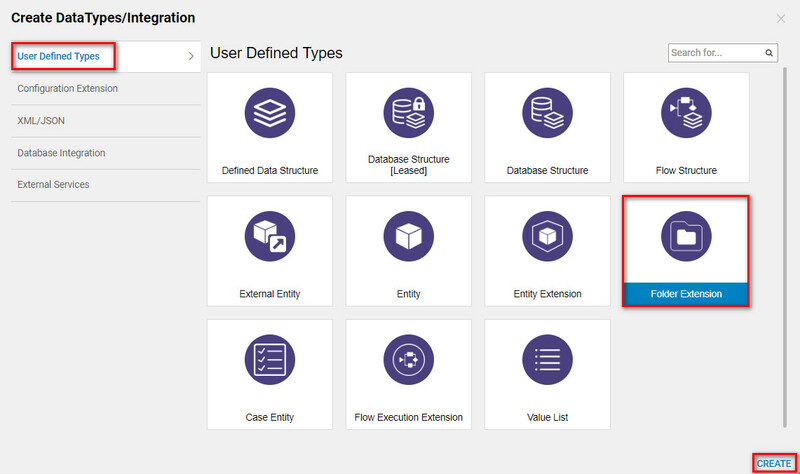 Begin in the portal by navigating to a Designer Folder, then select Create Datatypes > User Defined Type > Folder Extension. In the resulting Add Folder Extension Data Structure, give the new Folder Extension the name**"Car. "**	To define the additional properties of this folder, add Name	and Type. Is List -	Indicates that the data member is an array. Encrypt Data	- Would encrypt the data of the data member (which would automatically decrypt when used). Override Display Information	- Changes the display name for the data member during design time. Override Database Field Name	- Renames the database column name. SelectEditor	- Allows for a different default editor for the data member during design time. 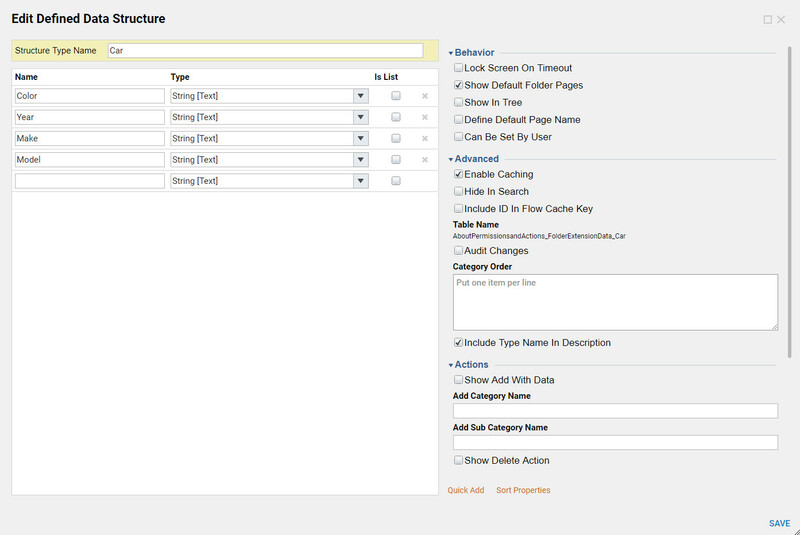 Configure Custom Attributes	- Allows for additional custom attributes for the member to be defined. Add the additional properties of the folder extension: Year, Make and Model. Next, define the Type Name Space of the folder extension. This organizational key can be useful for programmers. Because cars are a type of transportation, we will define the Type Name Space as "Transportation". Next, define the Actions of the folder extension. To give the new folder extension the same actions as any other folder, select every checkbox. Note that these actions are not controlled by permissions; any user who logs in and can see the folder can use these actions. If you want to lock down these actions according to the groups in which a user is a member, leave the Actions	options unchecked. Alternate actions based on a flow would be used instead (See the topic Creating Flow Actions). By selecting the Override Create Action Name	check box, you are able to define a new action name for creating folders of this extension type. Define a new action name of "Create Car." Show Default Folder Pages:	The portal will now show the default folder. Show In Tree:	The Folder Extension will now show in the designer folders folder tree. Define Default Page Name:	Will show when the Folder Extension is selected. 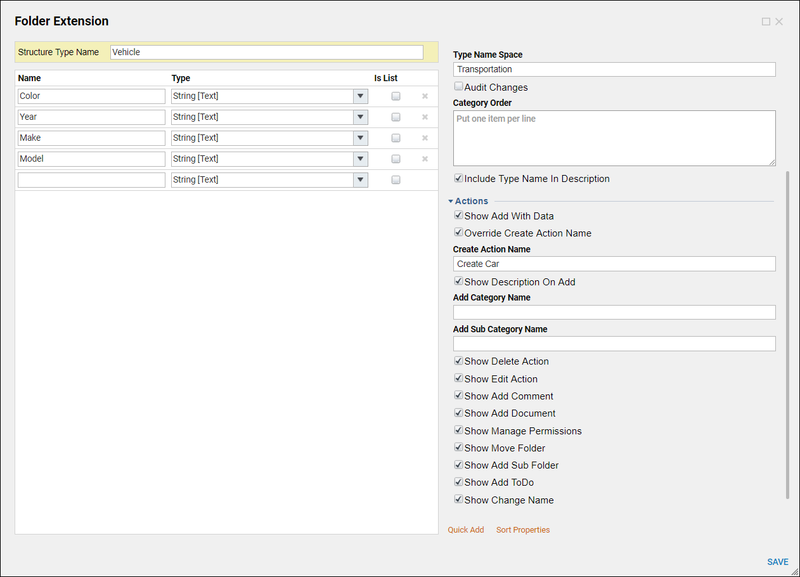 Default Page Name: "Car Details"
Next, select which flow steps to create for the Folder Extension. These steps will allow us to conveniently create, edit, delete and get folders of this Extension Type. Once the parameters have been defined, select Save. The new Folder Extension will appear in the Designer Folder ready to use. A Vehicle	data type is available to be used. For example, in a flow: Navigate in the steps tab toIntegrations > My Integrations > Folder Extensions > Vehicle	and in the Car tab you can see the different behavior options available to use. Notice a folder under the Designer Folder automatically appears. This is where the action flow will reside. Portal pages and flows that are created in this folder will be used as page templates and actions for instances of the folder extension. Select this folder then select User Actions > Add User Action	button. 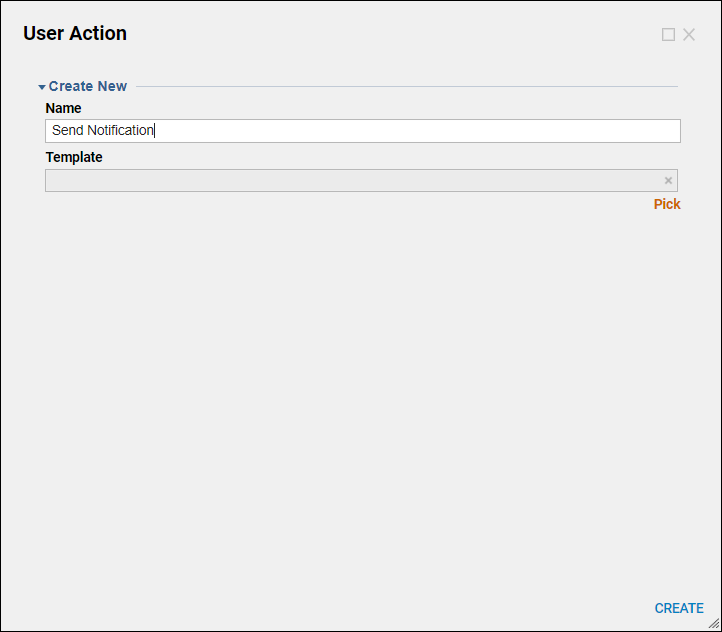 In the resulting User Action dialog, call this action "Send Notification"	and select Create. 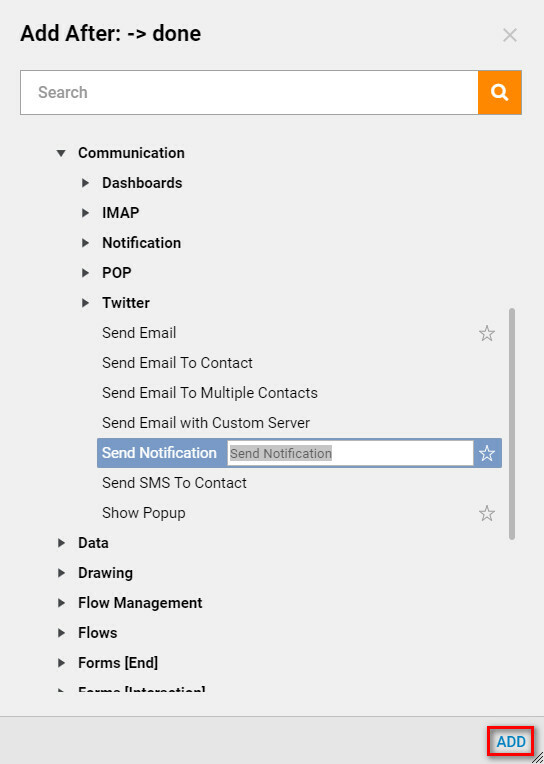 In the Flow Designer, select a Send Notification	step from the All Steps [Catalog] > Communication > Send Notification. Select Add	to add it to the flow designer. Next, configure the Send Notification step to send a simple notification to the current user or the default portal administrator. This completes the Action Flow, save the flow and close the Flow Designer. While creating the Car Folder Extension	type, we defined a default page name of "Car Details". To create this page, in the same Designer Folder as the Send Notification flow, select the Folder Extension to access the actions, click Add Page > Add Existing Page	button. In the resulting Add Existing Page dialog, select Create. 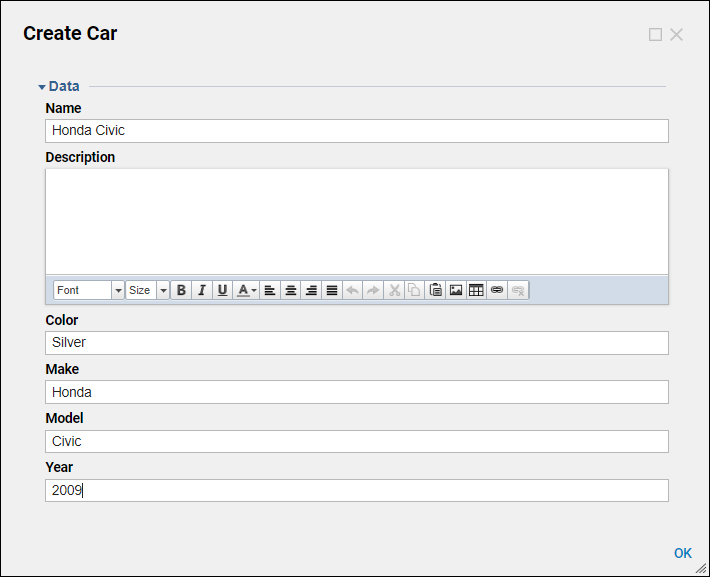 In the Create New Page dialog name the page "Car Details"	and select Create. In thePage Designer, select the Page Elements tab search for a Folder Header Data component, drag, and drop. Next locate a Folder Actions Bar	component drag and drop this on the page designer. This completes the default page, save and close the Page Designer. Return to the Designer Folder. 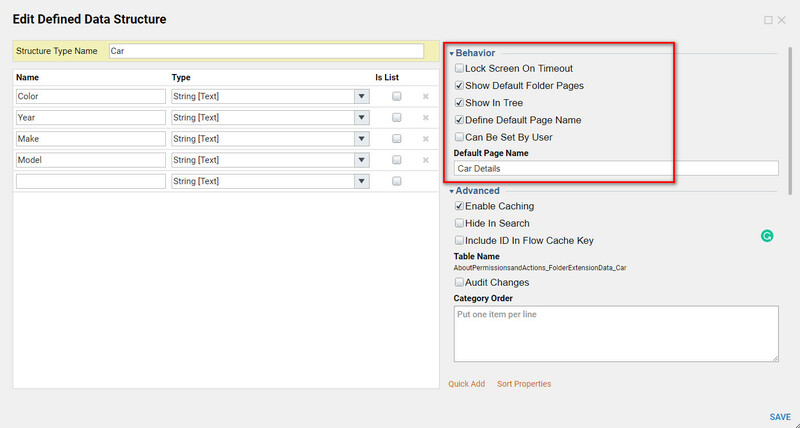 Now create an instance of the Car Folder Extension type, select the Actions menu and select Add > Entity [User Defined] > Create Car. In the resulting Create Car	dialog, give this new folder the name "Honda Civic" and complete its attributes. Select OK.
Navigate to Folder Extension Data and Honda Civic, see the default page we defined earlier. To edit this folder, select the Edit Car action. To use the**"Send Notification"**	action defined earlier, expand Honda Civics' action menu and select "Send Notification." The notification defined in the flow will appear in the top-right corner of the portal screen.